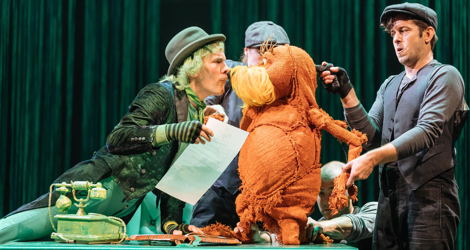 Direct from the UK, David Mirvish has brought us the Old Vic’s wonderfully imaginative production of The Lorax. Based on Dr. Seuss’s 1972 book, the show is ideal family entertainment filled with song and whimsical design that brings Seuss’s distinctive illustrations to three-dimensional life. The story is also an allegory about balancing the need to preserve the natural environment that has become even more relevant now that it was when Dr. Seuss wrote his story. Though the show premiered only in 2015, David Greig’s adaptation and Charlie Fink’s songs catch the mood and importance of the story so well the show already feels like a classic. The story of the Lorax is told within a frame. Kids in a polluted town are curious about a broken-down house where a Once-ler is said to live. Near it is a plinth meant for a statue of the Lorax that is missing. The only inscription is the word “Unless”. To find out what it all means, a Kid pays the ancient Once-ler to tell his story to her through a large hose called a Whisper-ma-Phone, though all the other children can listen in through the hose’s cloth sides. Here Greig, in fine imitation of Dr. Seuss’s rhyming verse, provides the Once-ler with a back story. The Once-ler used to live with his extended family who scrounged to make ends meet until they decide to kick him out of the house and take in a lodger Thneedsto make a bit of money. All on his own the Once-ler dreams of inventing something that will make him rich so that his family will be proud of him. He stops travelling when he reaches a beautiful place called Paradise Valley, where all the animals and plants live in harmony. Attracted to the silken tufts at the top of one of the Truffula trees, the Once-ler chops it down. All of a sudden the Lorax appears (a puppet manipulated by three puppeteers and voiced by David Ricardo-Pearce). The Lorax is the protector of trees and speaks for them because they have no tongues. He explains that if the Once-ler wants a tuft, he doesn’t need to chop down a tree but to get a ladder. To explain why he wants the tufts, the Once-ler claims that he wants to make “Theeds”. This turns out to be the ideal capitalist product because it is something that nobody needs but that everybody wants. Pooh-poohing the idea, the Lorax goes off on holiday, and the Once-ler is indeed downcast, until a passing stranger buys his first Thneed. From then on the Once-ler begins chopping down more trees and calls in his whole family to join in the Thneed-making business. Alarmed by what is happening, the Lorax returns and signs a contract with the Once-ler that he will use trees in only one nook of Paradise Valley, but soon, with the help of three lawyers, the Once-ler breaks the contract. After the factory springs up, so does a city and soon the animals are not only being pushed out of Paradise Valley but are dying from the pollution from the factories. What can possibly be done? This is how Act 1 ends leaving the audience in the same position as they are in the real world. The show does not have a fairy-tale ending but does hold out hope that if enough people become aware of what has happened and what things to change that improvement is possible. Greig’s strategy of making us at first sympathetic with the Once-ler is very canny in that we would like him to succeed and be accepted again by his wretched family. But Greig challenges our sympathy for the individual with the Once-ler’s deeds that have a negative impact on an entire community and destroy a self-sufficient ecosystem. Quite unlike the usual fairy tale Grieg forces us to shift our sympathy away from the single outcast and to question the nature of the outcast’s “success”. Though this is not a low-budget show, given its cast of 16 plus two musicians, it is one where the flaunting of production values and stage effects would undermine the show’s condemnation of wastefulness and excess. Therefore, designer Rob Howell has cleverly given the show a home-made look, one quite in keeping with Dr. Seuss’s own illustrations. The costumes for most of the characters look as if they have been patched together from the remnants of other costumes. No animal character wears a mask. The bear-like Bar-ba-loots wear fuzzy red overall’s and a cap that looks like the upper part of a bear’s head. The Swomee-Swans are dressed in ballet tulle with shoulder-to-waist netting to suggest wings. 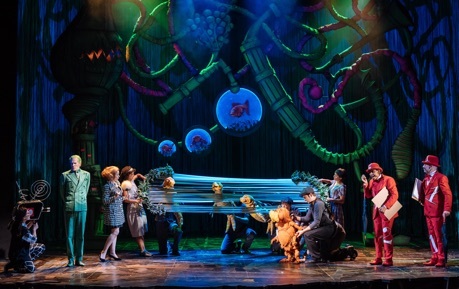 Otherwise, the Lorax and the other animals are played by puppets directed and designed by the company Gyre and Gimble. The Lorax is a proper bunraku puppet both in his one-third human size and in being manipulated by three puppeteers – one for the feet, one for the body and right arm and one for the head and left arm who also provides the voice. The Swans when flying are puppets on the ends of what look like long fishing rods that allow the puppeteers to flaps their wings as they soar over the heads of the first rows of the audience. The Humming-Fish are puppets with attachments at the head and foot who peep through water made up of plastic bands held stretched between two actors. While some effects are produced by group mime such as the Once-ler’s family travelling by car, at other times Howell does give in unnecessarily to eye-popping props, such as the terrifying Super Axe-Hacker, a mechanical tree-chopper. Luckily, such props are the exception since the show is most successful when it appeals to the imagination. When the Lorax climbs up one of the Truffula Trees to see over the forest to the place where he left the Once-ler, director Max Webster has the trees collapse in size to signify the Lorax’s upwards climb. Despite the large cast, the show has only two main characters – the Once-ler and the Lorax. All the other actors work as a tight ensemble. They narrate, they manipulate puppets, they play multiple small parts, they move props besides singing and dancing as a group. Simon Paisley Day moves from quite amusing to quite menacing as the Once-ler. He successfully transforms himself from an unhappy young boy to a young man to a rich tycoon to an embittered old man by changing his voice, posture and gestures. David Ricardo-Pearce, who voices the Lorax and manipulates its head, generally goes unnoticed because he is so effective. As in the best puppet shows a strange process occurs whereby we focus on the puppet itself even if the puppeteers manipulating it are not hidden. Nevertheless, Ricardo-Pearce well captures all the Lorax’s quirks from his general grumpiness to stronger feelings of outrage and resignation. Charlie Fink’s songs are generally written in a folk-influenced style accompanied by guitars, fiddles or banjo. But for certain music, such as that for the Super Axe-Hacker, he shifts into heavy metal. For the sly female lawyers, he moves into funk and Wendy Mae Brown as Von Goo has a chance to unleash her enormous voice in soul music stylings. The message of The Lorax about the importance of conserving natural resources and questioning the need for unrestrained industrialization could not be more timely. Our neighbour to the south has diminished the size of national parks and is contemplating drilling for oil in the Arctic, events with direct parallels in Seuss’s book even though it was written 45 years ago. The Lorax may be a joyously inventive family show, but it is also one that expects the audience to think and, if possible, take action. Photos: (from top) Simon Paisley Day, Laura Caldow, Ben Thompson and David Ricardo- Pearce; Simon Paisley Day (in green far left) and ensemble. ©2017 Manuel Harlan.